The demand within the global market for contraceptives has been rising on account of the growing incidence of sexually transmitted diseases, finds Transparency Market Research (TMR). The competitive dynamics of the global market for contraceptives have drastically changed over the past decade. The key players have resorted to informative marketing practices in order to create a regular consumer base. There is a high possibility of new business practices coming to the fore of the global contraceptives market. Moreover, the presence of established vendors in the global market for contraceptives is a key consideration for newbie vendors as well. It is expected that strategic alliances amongst large, medium, and small-scale vendors would be a common trend in the global contraceptives years to come. This will help the larger vendors in accessing the regional markets, while the smaller vendors could learn from the strategies of the established vendors. Furthermore, mergers and acquisitions are also projected to be a key trend in the global contraceptives market in the years to come. It is safe to prognosticate that new and more effective forms of contraceptives would be introduced by the vendors in the years to come. Some of the key vendors in the global contraceptives market are Allergan plc, Mankind Pharma, Janssen Pharmaceutical Company, Mithra Pharmaceuticals, HLL Lifecare Limited, and Cipla Inc.
Transparency Market Research (TMR) finds that the global contraceptives market would expand at a healthy CAGR of 6.10% over the period between 2017 and 2025. The cumulative value of the global contraceptives market would reach US$ 37,242.7 mn by 2025-end, rising up from a value of US$ 22,050 mn in 2016. On the basis of product, the demand for oral contraceptives is on a rise in recent times. Based on geography, the market for contraceptive in North America is expanding at a stellar pace due to growing awareness about STDs in the US and Canada. The rising incidence of sexually transmitted diseases has led national and international bodies to launch awareness campaigns. Several offline and online platforms have been leveraged to educate people about the need for using contraceptives. Hence, the demand within the global market for contraceptives is projected to escalate to new heights in the years to come. Furthermore, the availability of contraceptives such as condoms, vaginal rings, and pills across pharmacies has also aided market growth. Besides this, the presence of key vendors for producing various types of contraceptives has also aided market growth. The global market for contraceptives has expanded at a starry pace in recent times. 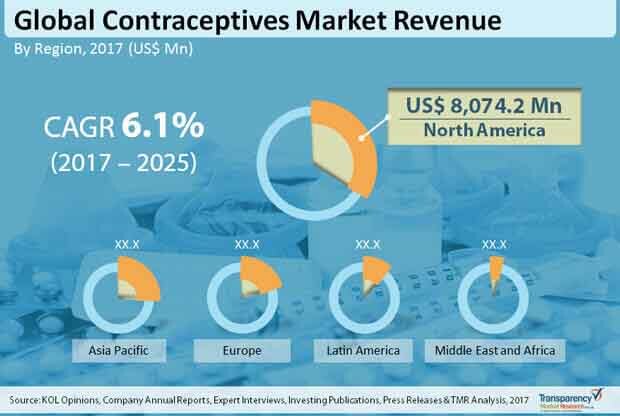 The availability of several nascent contraceptives such as contraceptive sponges, vaginal rings, female condoms, and diaphragms has created commendable opportunities for growth within the global market. Furthermore, contraceptives are now available across a number of selling points including pharmacies, online platforms, clinics, and hospitals. This factor has also emerged as a crucial driver of demand within the global contraceptives market. Promotion of contraceptive-use across schools and colleges has also led to the growth of the global market. The review is based on TMR’s review titled, “Contraceptives Market (Product - Contraceptive Drugs (Oral Contraceptives (Combined Contraceptives and Mini-pills), Contraceptive Injectable, and Topical Contraceptive Patch) and Contraceptive Devices (Male Contraceptive Devices and Female Contraceptive Devices (Female Condoms, Contraceptive Diaphragms, Contraceptive Sponges, Contraceptive Vaginal Rings, Intrauterine Devices, Sub-dermal Contraceptive Implants, Non-surgical Permanent Contraception Devices)); Distribution Channel - Hospital Pharmacy (Public and Private), Independent Pharmacy, Online Platform, and Clinics) - Global Industry Analysis, Size, Share, Growth, Trends, and Forecast 2017 – 2025”.